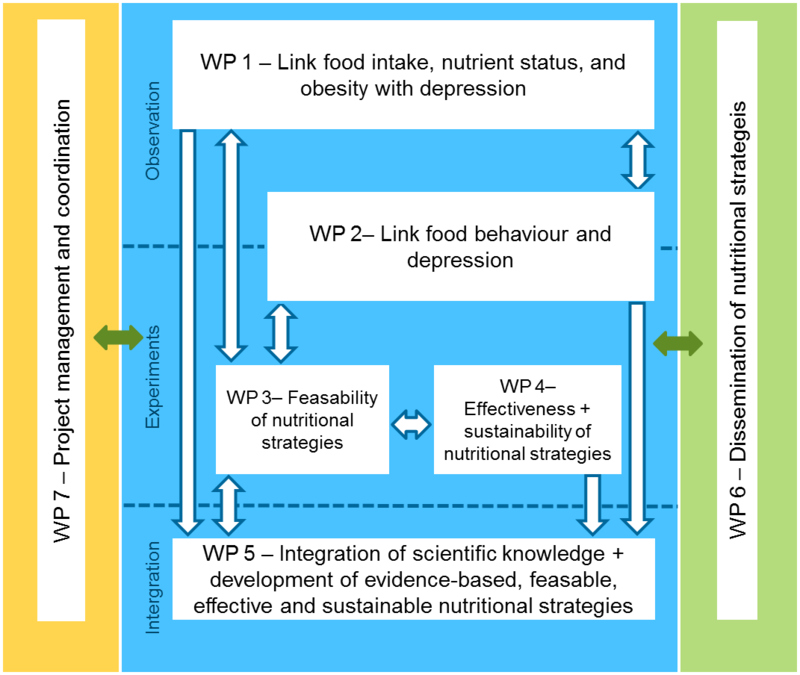 To better understand the multi-sectoral pathways underlying the bidirectional links of food-related behaviour, status and obesity with depression. Depression is one of the most prevalent and disabling disorders in the EU and it places a heavy burden on individuals and their families1-2. A large proportion of the EU population is overweight3 which increases the risk for depression4. Improvement of food-related behaviour and nutrient status may prevent depression, specifically for people prone to being overweight5. Unravelling the different pathways that link nutritional behaviour to the development of depression and identifying potential psychological, lifestyle, and environmental mechanisms is one of the aims of the MooDFOOD project9. MooDFOOD is one of the largest consortia investigating depression and the first to address how food intake, nutrient status, food-related behaviour and obesity are linked to the development of depression. MooDFOODs integrated results are due out in the Autumn of 2018 and have great potential to provide people with healthy strategies to help reduce their risk of depression and promote healthy eating. Depression and obesity are common conditions that have been consistently associated. Evidence-based research from epidemiological and clinical trials suggests a bidirectional link between being overweight and psychological health. Community-based cross-sectional studies found that depression is associated with an 18 % increased odds of being obese4. The well-established epidemiological relationships between diet and depression and the positive results of several intervention studies raise the possibility that diet and nutrition may offer key modifiable targets for the prevention of MDD5. Prevention can help to lessen the global burden of the depressive disease7, and cost-effective interventions are required. To date, few studies have directly manipulated diet and food-related behavior alone to examine their effects on preventing depression, leaving unresolved whether a true causal association exists from diet to depression8 and none thus far have specifically targeted high-risk, overweight individuals. MooDFOOD employs a unique research approach9 where high quality data from longitudinal prospective European cohort studies will be combined with new data from surveys, short-term experiments and a multi-centre long-term preventive intervention study to explore the multifaceted links of food intake, nutrient status, food-related behaviour and obesity with depression. A large double-blind randomised control trial involving over 1000 participants from around Europe with a 2x2 factorial design. Within the trial, high risk participants (classified as overweight or obese with elevated depressive symptoms) were randomly allocated to receive a multi-nutrient supplement, food related behavioural therapy or a combination of both. The onset of Major Depressive Disorder, and depressive symptoms were assessed after 1 year. New data collected from surveys and short-term experiments to investigate the potential of food related behaviour, particularly mindful eating, on depression. A thorough scientific integration process based on the research outputs will be conducted to produce comprehensive conclusions on the role of diet in preventing depression and a collaborative dissemination approach will be developed to share the resulting nutritional strategies and achieve maximum uptake by EU citizens. From its initiation, the MooDFOOD project was founded on a strong collaborative research and patient representative network around Europe. Diet and depression is an emotive topic that has seen much media focus and is of great interest to policy makers, health professionals and the public as it holds great potential to reduce the mental health burden and support the promotion of healthy eating. By bringing together lead researchers in nutrition and depression from around Europe MooDFOOD has benefited from expert input and design to produce evidence based conclusions which are based on the strongest forms of scientific research. As a European Commission funded project the MooDFOOD project aims to benefit all Europeans.This poses challenges in appropriate adaptation to ensure all countries are represented and informed. As the project has involved many different research outputs and strategies (e.g. RCT, meta-analysis, surveys etc) it has proved challenging to ensure these findings are delivered in an integrated approach to provide a holistic picture of the role of diet in the prevention of depression. Funding for this research project is provided by the European Union FP7 MooDFOOD Project ‘Multi-country cOllaborative project on the rOle of Diet, FOodrelated behaviour, and Obesity in the prevention of Depression’ (grant agreement no. 613598). The prevention trial in the UK is supported by the National Institute for Health Research (NIHR), through the Primary Care Research Network and the NIHR Exeter Clinical Research Facility. EU citizens who will be reached through the produced resources/ nutritional strategies, health professionals and media coverage. An analysis of the sustainability of this promotional food related behavioural therapy is also due to be assessed (Trial protocol available for download through the resources section). The Consortium was awarded 8.9 million Euros to implement the MooDFOOD Project. Contributing to the academic fields of diet and depression, and translating current evidence into nutritional strategies, the MooDFOOD project has the potential to impact on dietary patterns and depression incidence across the European Union. By applying the EU Commissions guide to communicating Research and Innovation the project strives to achieve far-reaching dissemination plans to influence the knowledge and practise of policy makers, health professionals and EU citizens. The MooDFOOD projects integrated conclusions, results, policy brief, resources and press kits are due to be published in the Autumn of 2018.